Rapid advancements in technology have shaped many industries and changed the global economy and work nature of people around the world. Similarly, medical transcription services have changed significantly in the past few years. The major driving factors behind this radical change include communication technologies and rapid internet connectivity. The process of medical transcription involves receiving the dictation by tape, voice file, or digital system, and using ear phones, start-stop controls and a word processing program. There are a wide range of word processing systems which are being used these days by transcriptionists. Why is outsourcing medical transcription service a profitable option? It is quite well known that outsourcing medical transcription services is extremely beneficial to any company. The main factors behind why people choose to outsource medical transcription services are cost reduction, quick turnaround time, and total security. What are the advantages of outsourcing medical transcription to India? The salaries of medical transcriptionists are much lesser in India as compared to the US or other developed countries. Therefore Indian companies are capable of providing cost-effective solutions and effective medical transcription services. India has a huge pool of talented English speaking resources that are trained to handle customer requests from different backgrounds and cultures. Since India works in a different time zone as compared to other countries, outsourcing to India can give a considerable advantage to companies and allow them to get work done within a quick turnaround time. Turnaround time is a critical factor in the medical transcription field. How can one submit medical dictations? Dictations can be submitted to us either via phone, mail or even with the help of a secure file storage system. Just contact the company and they will guide you through the entire process of dictation submission. How will the dictation be processed? As soon as you sign up with us, a dedicated team of medical transcriptionists will be assigned for your project depending on your requirement and project load. Once they receive the dictation it is transcribed with great accuracy and it goes through several quality checks before it is available to the client. How can one receive the transcription? Clients can receive the medical transcriptions in any format they wish for or even in multiple formats. The customers can ask for an option to download the transcriptions from the Internet or also request our team lead to send them a hard copy of the medical transcriptions. How can one know if the vendor is reliable or not? Any company which is serious in business will keep customer related topics as priority. Keep in mind how quickly they respond to your enquiry. It is always good to ask the vendor a few questions before starting off such as company details, client references, past projects, etc. This helps to evaluate the company's abilities and build the trust needed for a healthy business relationship. The client needs to be sure about the data security plans of the medical transcription company. The best way to know this is by asking them about their security plans. Most of the outsourcing companies have strict data security measures in place such as access cards, fingerprint scanners, cameras for close monitoring, etc. Outsource2idia has been providing high-quality medical transcription services and a plethora of other healthcare services to clients around the world. Our cost-effective services help clients to save considerable amount of time and money. We follow strict security measures within our organization and you can be assured that your data is completely safe with us. 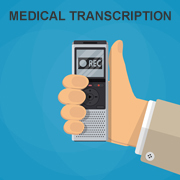 Our medical transcriptionists are Certified Medical Transcriptionists (AAMT - Certified CMT) and are trained to handle any type of medical transcription requirements. If you are looking for a reliable medical transcription company, then look no further. Write to us or talk to our representatives and we will be more than happy to help you.